Previous evidence indicates potential variation in the quality of care of cancer patients. We aimed to examine whether recent changes in the treatment of oesophagogastric cancers have been distributed equally among different patient subgroups. We analysed population-based cancer registry data about the treatment patterning of oesophagogastric cancer (other than oesophageal squamous cell carcinoma) during 1995-2006. There were 14,077 patients aged ≥40 years (69% men). There was only limited information on stage, and no information on co-morbidity status. During successive triennia, curative surgery use decreased from 28% to 20% (p < 0.001) whilst chemotherapy use increased from 9% to 30% (p < 0.001). Use of palliative surgery and of radiotherapy increased significantly but modestly (7% to 10%, and 9% to 11%, respectively). In multivariable logistic regression adjusting for age group, gender, diagnosis period and tumour type, curative surgery and chemotherapy were used less frequently in more deprived patients [per increasing deprivation group Odds Ratio (OR) = 0.96, 95% Confidence Interval (CI) 0.93-0.99, and OR = 0.90, 95%CI 0.87-0.93, respectively, p < 0.001 for both)]. Chemotherapy was also used less frequently in women (OR = 0.76, p < 0.001). During the study period, curative surgery decreased by a third and chemotherapy use increased by more than three-fold, reflecting improvements in the appropriateness and quality of management, but chemotherapy use, in particular, was unequal, both by socioeconomic status and gender. Oesophageal and stomach cancers [including Oesophageal Squamous Cell Carcinoma (OSCC), Oesophageal Adeno-Carcinoma (OAC), Junctional/Cardia Adenocarcinoma (JCA) and Non-Cardia Gastric Adenocarcinoma (NCGA)] are common. In the UK, they account for over 15,000 new cases per year, and over 13,000 deaths, with stomach and oesophageal cancers being the 6th and 8th most common malignancies in men. Although radical surgery could offer cure, fewer than a quarter of all patients present at a stage that can be treated surgically. For suitable patients, peri-operative chemotherapy has been shown to improve survival[3, 4]. This is thought to have led to a substantial increase in chemotherapy use in recent years. In recent periods, five-year survival has been <17% for stomach cancer, and <13% for oesophageal cancer[6–8]. In men with oesophagogastric cancer, survival has been substantially poorer in more socio-economically deprived patients[5, 7–10]. In contrast, in England and Wales, five-year relative survival differences between most and least deprived women were relatively small (-0.2%) for oesophageal cancer, whereas five-year survival was better (+1.7%) in most compared with least deprived women for stomach cancer. The exact causes of socioeconomic and gender differences in survival are not known, but in theory those may reflect differences in clinical management, tumour type or stage at presentation, and co-morbidity. Differences in patient (e.g. co-morbidity) or tumour factors and stage do not seem to fully explain socioeconomic inequalities[11–15]. Conversely, differences in healthcare may be responsible, and, in some studies, no survival inequalities were observed when patients were treated in the same service setting[12, 17, 18]. However, overall, the evidence supporting any of the above explanations is limited. A number of high profile policy initiatives over recent years in the UK have aimed to focus efforts on improving outcomes for cancer patients, and on reducing socioeconomic inequalities in outcomes[19, 20]. Motivated by the above considerations, we conducted a study to examine whether recent changes in the treatment of oesophagogastric cancers have been distributed equally among different patient subgroups. Non-identifiable information was obtained from the Eastern Cancer Registration and Information Centre (ECRIC), one of the regional English population-based cancer registries, responsible for a general population of about 5.5 million (which is about 10% of the English population) residing in the East of England Government Office Region, including the counties of Essex, Bedfordshire, Hertfordshire, Cambridgeshire, Norfolk and Suffolk and the Unitary Authorities of Luton and of Peterborough. The Registry's proportion of 'Death Certificate Only' registrations for all malignancies (which is a useful summary indicator of good quality of registration processes) has remained very low during the study period. OSCC (defined in order to be excluded from further analysis, as explained above): ICD-10 C150-9 and ICD-O M80703 ('Squamous cell carcinoma', 88% of cases in this category), or M80713, M80723, M80733, M80743, M80943, M81233, M85603). OAC: ICD-10 C150-9 and ICD-O M81403 ('Adenocarcinoma', 92% of cases in this category) or M81443, M81453, M82603, M83103, M84803, M84813 and M84903. JCA: ICD-10 C160 and ICD-O M81403 ('Adenocarcinoma', 87% of cases in this category) or M81443, M81453, M82103, M82603, M83103, M84803, M84813 and M84903. NCGA: ICD-10 C161-9 and ICD-O M81403 ('Adenocarcinoma', 83% of cases in this category) or M81443, M81453, M82103, M82603, M84803, M84813 and M84903. 'Other': All other tumours (principally 'Carcinoma', 70% in this category). We measured patient socioeconomic status with an ecological (i.e. small area) measure. Specifically, patient socioeconomic status was assigned using the Index of Multiple Deprivation (IMD) 2004 deprivation score of their Lower Super Output Area (LSOA) of residence. IMD is composed of different domains, including among others economic, social, education, health and housing indicators, and indicates the level of deprivation of residents of a small area relative to the residents of other small areas. LSOA's are co-terminous small areas with similar socio-demographic characteristics (typically comprising five Census Output Areas with about 1,500 residents). This low level and 'homogenous' aggregation minimises the potential for ecological fallacy (misattribution of individual socioeconomic status using the 'average' socioeconomic profile of a greater sample of individuals). Quintile groups using the national distribution of LSOA deprivation scores were used in subsequent analysis (groups 1 to 5: 'least' to 'most' deprived respectively). Information was available on surgical treatment within six months from diagnosis, coded by Registry staff, using the Office for Population and Censuses and Surveys, 4th Revision (OPCS 4) classification system. Curative surgery was defined using appropriate excision surgery codes, and palliative surgery defined as surgical placement of stent or gastrojejunostomy. More specifically, the following operational definitions (based on OPCS 4 codes) were used: Curative surgery: G281-3, G288-9: partial excision of stomach (33% of all curative surgery cases); G011-3, G018-9: excision of oesophagus and stomach (25%); G021, G023, G028-9: total excision of oesophagus (8%); G271-5, G278-9: total excision of stomach (17%); G031, G038-9: partial excision of oesophagus (16%); G041-3, G048-9: open extirpation of lesion of oesophagus (1.7%); G291-5, G298: open extirpation of lesion of stomach (1.1%). 1.5% of all patients had more than one of the above curative surgery codes. Palliative surgery: G119: Open placement of prosthesis in oesophagus (81%); G331: Bypass of stomach by anastomosis of stomach to jejunum (19%). A patient had both palliative procedures. We analysed these two types of palliative surgery separately in interim analysis, but report the findings in an aggregate fashion, both because disaggregated findings were similar, and because the gastrojejunostomy group was very small (less than a fifth of all palliative surgery). Information was also available on chemotherapy and radiotherapy treatment within six months from diagnosis - whether with a curative or palliative intent. We examined predictors of use of curative surgery, palliative surgery, chemotherapy, and radiotherapy (patients could belong to one or more of these treatment groups); as well as for 'combined' (within six months from diagnosis) use of both curative surgery and chemotherapy. We did not consider any other combined treatment groups, because of small numbers. For example, within six months from their diagnosis, only 160 (1.1%) patients were treated by both radiotherapy and curative surgery, only 146 (1.0%) by all of curative surgery, chemotherapy and radiotherapy; and only 85 (0.6%) by both curative and palliative surgery. In univariable analysis, proportions of patients in each treatment group were calculated by age group (three groups, 40-59, 60-74, and ≥75), gender, diagnosis period (four triennial periods, 1995-7, 1998-2000, 2001-3, and 2004-6), deprivation group (1-5), and tumour type. Differences between patient groups were examined with the chi-squared test (for gender or tumour type), or linear regression for ordinal variables (adjusting for age group, diagnosis period or deprivation group as applicable). In multivariable analysis, predictors of treatment use were examined by logistic regression, with treatment status as the binary dependent variable, and adjusting for gender, age group, diagnosis period, deprivation group and tumour type. We furthermore repeated all analysis by sequentially including in models interaction terms for deprivation and gender, deprivation and age group, and deprivation and diagnosis period. Stage information was principally limited to 44% (440/1,009) of OAC patients diagnosed between 2004-6, using the 5th Edition of the TNM classification, comprising stages I-IV). For other cancer types and diagnosis periods, the number of patients with stage information was negligible. For OAC patients diagnosed during 2004-6, we examined predictors of stage ascertainment, and of advanced stage (defined as stages III-IV). We subsequently examined predictors of treatment use, again using multivariable logistic regression analysis, and compared the degree of concordance of the findings relating to staged OAC patients with the findings obtained from the 'all cases' analysis for the same period. There were 14,077 patients with relevant oesophagogastric cancers during the 12-year study period (5,112 oesophageal cancers other than OSCC, and 8,965 stomach cancers). 9,653 (69%) of the patients were men. The mean age at diagnosis was significantly greater for women, by +5.6 (75.1 vs. 69.4), +3.5 (72.4 vs. 68.9) and +2.0 (75.0 vs. 73.0) years for OAC, JCA and NCGA respectively. Overall during the study, 25% of all patients were treated by curative surgery, 8% by palliative surgery, 20% by chemotherapy, 11% by radiotherapy, and 5% by both curative surgery and chemotherapy (see Table S1 in Additional file 1). Between 1995-7 and 2004-6, curative surgery use decreased by about a third (from 28% to 20% of all patients, p < 0.001) and chemotherapy use increased by more than three-fold (from 9% to 30%, p < 0.001). Palliative surgery and radiotherapy use increased significantly but slightly. These associations remained significant in multivariable analysis (See Table S2 in Additional file 2). In both univariable and multivariable analysis, more deprived patients were less likely to be treated with curative surgery, chemotherapy, and their combined use (Table 1 and Figures 1, 2). These differences were particularly prominent for chemotherapy use. For chemotherapy use there is an apparent linear decrease in frequency of use with increasing deprivation; however, for curative surgery use, there appears to be a (non-linear) 'step' effect, with socioeconomic variation mainly relating to the most (and perhaps the one but most) deprived group. 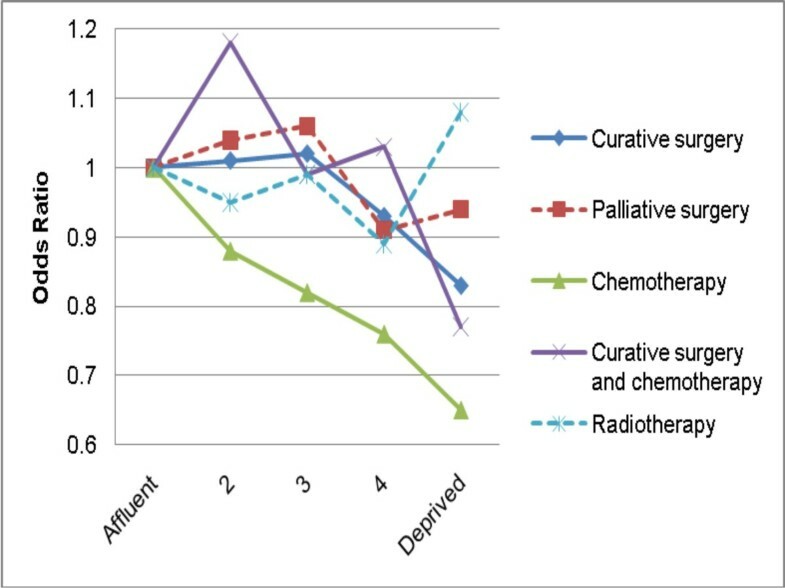 An apparent deprivation gradient for palliative surgery use did not reach significance, whilst no deprivation gradient was apparent in multivariable analysis for radiotherapy use. None of the interaction terms between deprivation and each of gender, age group and diagnosis period were significant, for any of the treatment groups, indicating that the effect of deprivation on treatment use was similar in both sexes, and in any age group and diagnosis period. Univariable analysis and unadjusted and adjusted Odds Ratio for treatment use by deprivation group (from multivariable logistic regression models, adjusting for age group, gender, diagnosis period and tumour type). OR: Odds Ratio; 'Depr. ': Deprivation; 'cont'; Continuous (variable); CI: Confidence Interval; 'Cur': Curative. p*: From linear regression models, entering deprivation group as a continuous variable, as a test for trend. Percentage of patients treated (with curative surgery, palliative surgery, chemotherapy, curative surgery and chemotherapy in combination, and radiotherapy) by deprivation group. Continuous lines denote significant and dashed lines non-significant associations in univariable analysis. Odds ratios for treatment use (curative surgery, palliative surgery, chemotherapy, curative surgery and chemotherapy in combination, and radiotherapy) by deprivation group. Continuous lines denote significant and dashed lines non-significant associations in multivariable analysis adjusting for age group, gender, diagnosis period and tumour type. Older patients were significantly less likely to be treated with any of the reviewed treatments except palliative surgery, and these associations remained significant in multivariable analysis. Men, in univariable analysis, were significantly more likely to be treated by any of the reviewed treatments except palliative surgery. However, in multivarible analysis, men were more likely to be treated only with chemotherapy (p < 0.001), and palliative surgery (but not significantly so, p = 0.092). Stage information was available for 440 of 1,009 (44%) OAC patients diagnosed during 2004-6. Stage ascertainment was significantly greater for patients <75 (53% vs 32%, p < 0.001) but was not associated with gender or deprivation (data not shown). Advanced stage (i.e. stages III or IV) was not significantly associated with age, gender or deprivation. As observed in 'all patients' analysis, use of curative surgery, and of chemotherapy, decreased with increasing deprivation, but only approaching significance (OR: 0.86, p = 0.134, and OR: 0.88, p = 0.129, respectively). Similarly, there was less frequent chemotherapy use in women, again only approaching significance (OR: 0.64, p = 0.114). Overall, comparing the effects of age, gender and deprivation on use of any of the five reviewed treatments among 'all' and 'staged' OAC patients during 2004-6 (15 comparison pairs in total), eight pairs of observations were concordant for both effect direction and significance level; five were concordant for effect but not for level of significance; and two were discordant (in relation to effect direction). There were substantial changes over time in the management of over 14,000 oesophageal and stomach cancer patients diagnosed over a 12-year period in the East of England. 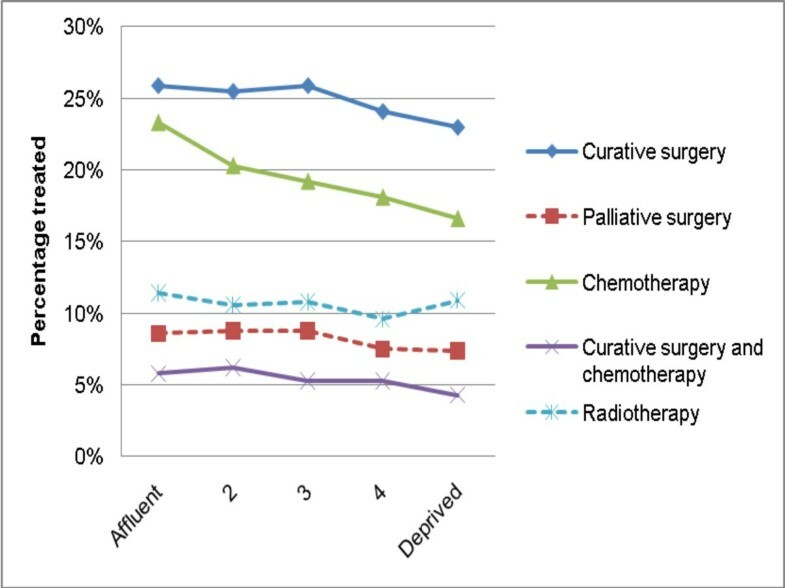 During the study period, curative surgery use decreased substantially (by over a quarter) and chemotherapy use increased dramatically (by more then three-fold). Adjusting for other variables, more deprived patients were less likely to be treated by curative surgery and by chemotherapy, however this association was much stronger for chemotherapy. Chemotherapy use was also less likely in women. Deprivation differences in use of curative surgery, although statistically significant, were relatively limited in both absolute and proportional terms (e.g. 26% compared with 23% use, in least and most deprived patients respectively). In contrast, socioeconomic treatment patterning was much stronger for chemotherapy use (e.g. 23% compared with 17% use, in least and most deprived patients respectively). Moreover, although the apparent effect of deprivation status on frequency of chemotherapy use was linear, no such consistent effect was observed for curative surgery use. These observations mean that data limitations (described below) could at least in theory be responsible for the observed socioeconomic difference in use of curative surgery. However, given the substantial effect size of deprivation status on use of chemotherapy, as well as its apparent linear effect, this is less likely to be the case for the observed socioeconomic variation in chemotherapy use, which is more likely to be genuine. The main strengths of our study are its population-based basis and the fact that it covers a substantial time period and very large number of patients. The main and most important limitation of our analysis is the lack of information on stage at diagnosis for the great majority of the patients. Population-based survival estimates for oesophageal and stomach cancers have remained poor and changed very little during the study period[6–9]. This would strongly suggest a stable over time distribution of stage among incident cases, that could not account for the observed substantial reduction over time in use of surgery and the dramatic increase in use of chemotherapy. However, lack of stage information poses certain interpretation challenges in relation to the observed socioeconomic differences in use. Several non-UK studies suggest that lower socioeconomic status individuals may have more advanced diagnosis stage[28, 29]. This limitation has to be seen in the context of the population-based nature and size of the dataset, and the study period: There is very limited availability of stage information for upper gastrointestinal cancers in population-based datasets covering the same period in England, although this weakness in cancer registration systems is now being rapidly addressed. No significant association between deprivation and stage at presentation was observed among the subgroup of OAC patients for whom stage information was available, but this finding may simply reflect lack of power to detect a significant association, and is best considered as inconclusive. Nevertheless, if more deprived patients in this dataset were presenting at relatively more advanced stage, one could have expected an association between increasing deprivation and increasing use of palliative surgery. No such significant trend was observed, in fact, there was an apparent trend in the opposite direction, which however did not reach significance. Therefore, even if they existed, potential deprivation group differences in stage at presentation are unlikely to fully explain the observed socioeconomic gradients in use of curative surgery and chemotherapy. Previous research also indicates that survival inequalities cannot be fully explained by socioeconomic differences in stage[13, 14]. These interpretation challenges should be addressed by further research. Another limitation is the lack of information on patients' co-morbidity status, which may vary between different oesophago-gastric cancers, and deprivation groups. However, if more deprived patients had a greater co-morbidity burden, one could again expect this to have mainly influenced surgical treatment use (because of the greater anaesthetic risk of patients with higher co-morbidity burden). In contrast, socioeconomic inequalities in both the use of surgery and the use of chemotherapy were observed (and as noted above, socioeconomic variation in use was greater for chemotherapy). These observations would indicate that potential socioeconomic differences in co-morbidity status are unlikely to fully explain the observed deprivation differences in treatment use. Furthermore, we could not examine whether chemotherapy or radiotherapy were used with a palliative or curative intent. However, the observed increase in combined use of curative surgery and chemotherapy suggests that most of the increase over time in chemotherapy use could be expected to have been in an adjuvant context - although pre-operative chemotherapy will not have actually been followed up by actual surgery in all patients, because of inadequate response. Treatment status information might have been incomplete (or inaccurate) for some patients - particularly in relation to palliative interventions. However, this would have only introduced non-differential error, and should have not therefore biased the observed findings in relation to socioeconomic or gender variation (or its lack). Such an assumption is both logical and supported by empirical evidence from other 'routine data' sources. Similarly, it is possible that changes during the study period in data quality (including in the degree of treatment status ascertainment) may at least in part be responsible for some of the observed findings. However, there has been a high degree of consistency over time in cancer registration systems used in the UK, where cancer registration has been established over a number of decades. In addition, potential improvements in capturing treatment status could have perhaps explained the observed increase in chemotherapy use but are very unlikely to be responsible for the observed decrease in use of curative surgery. Furthermore, any changes over time in treatment status ascertainment would have been non-differential between patients of different gender and socioeconomic groups,  and cannot therefore be responsible for the observed gender and socioeconomic differences in use. For these three reasons, we believe that potential secular changes in data quality are unlikely to be responsible for the observed findings. We could not examine treatment use beyond six months from diagnosis - however, given the poor prognosis of oesophagogastric cancer, for most patients, treatments that would have been administered beyond that period are likely to have been palliative. Information about whether patients were treated in private hospitals (for all or part of their care) would have been useful. We had no information about other aspects of treatment quality (for example: chemotherapy or radiotherapy dose and regime; treatment timeliness after diagnosis; and adequacy of surgical excision). Information about other quality of care aspects would have made the analysis more informative. The observed decrease over time in use of curative surgery is consistent with similar trends reported in two recent national studies (which however also included OSCC in analysis)[2, 32]. More specifically, an England and Wales audit including information about over 105,000 patients indicated that 'cancer surgery' use in oesophagogastric cancer decreased by nearly a third (from 28% to 20%) between 1998 and 2005, similar to our own findings. Comparing our findings with this study, although we defined tumour categories differently, we also found curative surgery rates being highest for patients with junctional and stomach adenocarcinomas, and relatively lower for OAC patients. Similarly, in Ireland, there was a nearly two-fold reduction in curative surgery use between patients diagnosed in 2000-1 compared with 1994-6. These findings may reflect improved patient selection because of better staging, either by endoscopic ultrasound, and/or CT and PET scanning[2, 29]. Previous reports indicate a near doubling in use of 'either chemotherapy or radiotherapy' between 1998 and 2005, from 18% to 34%, without further dis-aggregation of this figure into chemotherapy and radiotherapy. Our findings strongly indicate that the greatest rise in use of non-surgical treatments for (non-OSCC) gastro-oesophageal tumours relates to chemotherapy, probably reflecting increasing peri-operative use in patients judged suitable for curative surgery,[3, 4] as also directly observed in our study, with increasing trends in the combined use of chemotherapy and curative surgery. The findings would support the hypothesis that socioeconomic differences in treatment use may be at least partly responsible for survival inequalities among men with oesophageal and stomach cancer, and, in relation to curative surgery, they are consistent with those from a population-based study in The Netherlands. Deprivation differences in curative surgery and in chemotherapy use were present in both men and women. This provides no insights into reasons for the previously reported better survival in most deprived women with gastric cancer, although potential differences in stage at presentation between the two genders may be responsible. Most of the observed gender differences in treatment use did not persist once the effect of other variables was adjusted for in multivariable analysis, most likely reflecting the fact that women patients were on average older than men. Nevertheless, the observed lower chemotherapy use in women, which persisted even in multivariable analysis adjusting, among other variables, for age, is surprising. As there were no significant gender differences in use of both chemotherapy and curative surgery, the observed differences might principally relate to use of chemotherapy with a palliative intent, however, this hypothesis would require further research. Using East of England cancer registration data on the management of oesophago-gastric cancer (other than OSCC) during 1995-2006, we found that curative surgery use decreased and chemotherapy use increased, reflecting improvements in overall quality and appropriateness of care. However, use of chemotherapy, in particular, was less likely in more deprived patients and women. Further research should aim to explore the potential influence of differences in stage at diagnosis and in co-morbidity status on variation in treatment use. It should also encompass other aspects of healthcare quality, for example treatment timeliness. We would wish to acknowledge the work of staff of the Eastern Cancer Registration and Information Centre (ECRIC). We would also wish to thank Dr Clement Brown, Medical Director, Eastern Cancer Registration and Information Centre (ECRIC), for his work relating to staging of OAC cases. The work in part relates to part-fulfilment (dissertation) of the MPhil in Epidemiology course of the Department of Public Health and Primary Care, University of Cambridge, by C Gajperia, who was a beneficiary of Cancer Research UK studentship scheme endowed to the Department. No other external support or funding was received for the conduct of this study. As was the case in this study, cancer registries in the UK have policies that permit the release of anonymised (non-identifiable) data to researchers, with the aim of generating evidence that can be of use to improving patient care. More information about the regulatory environment underpinning the function of UK Cancer Registries can be found at the UK Association of Cancer Registries website http://82.110.76.19/. GL conceived the original idea for the study, with contributions form all other authors. JB and CG analysed data, and JB, DG and KW collected and quality assured them. MR provided clinical advice and commentary on the methods and on interpretation. All authors interpreted data and have read and approved the final manuscript.